Hola! I know it’s been a looooooooooooooong time since I’ve posted on here. I am not abandoning my blog. I promise. I blame my absence on baby #3. I was super sick for a few months which added to some existing depression and I pretty much laid on the couch for the first half of the year… BUT, all is now well with both the baby and I and I’ve been sewing up a storm. I’m excited to share all my newest projects with you. P.S. That picture features my 23 week belly just in case you were wondering. This little project is the perfect one to start with. I bought these capris off of Zulily because I needed some summer maternity pants to wear AND they were only $12. Steal! I didn’t love that they had holes in them, but for $12 I couldn’t pass them up. So they came in the mail and I tried them on. I realized immediately that not only should I have bought a size up, but that I wasn’t even sure a bigger size would accommodate my calves. They were quite literally turning my legs blue. I frequently have this issue. Apparently my calves are a menace to society and shouldn’t be shown off in skin tight pants. I didn’t really have a choice. I had a family reunion that weekend and no time to get anything else to wear as we have no maternity selection locally. 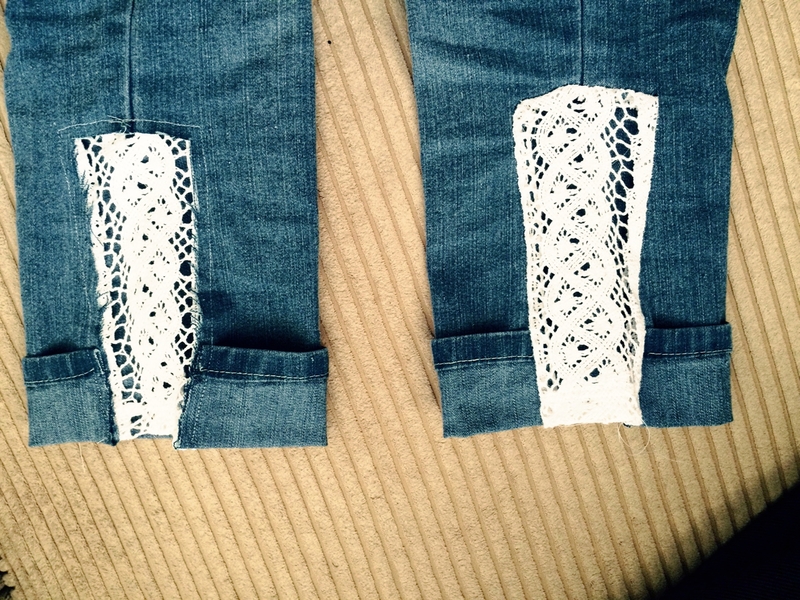 I decided to make some lace inserts to widen the calves and deal with the fact that they were still a bit too small. Everything I looked up online had triangle inserts. 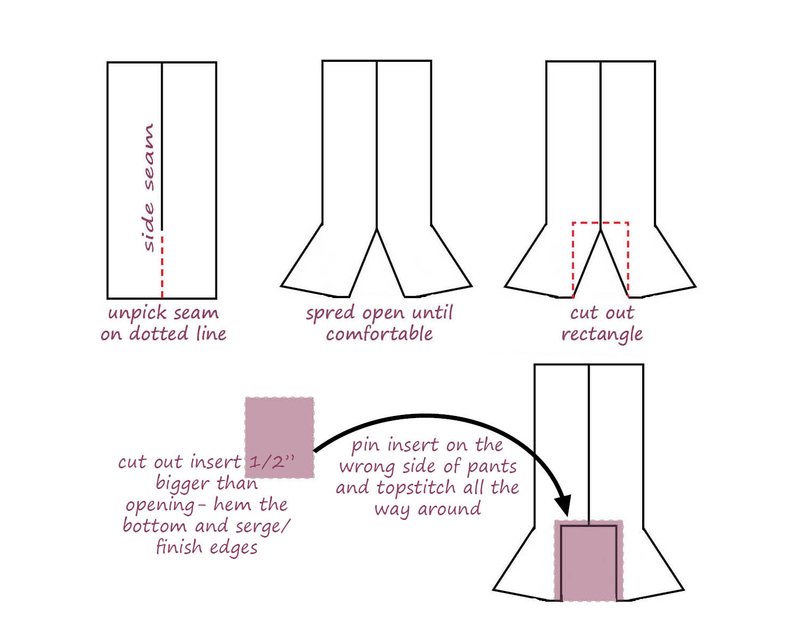 I thought that made the alteration scream home done and I wanted it to look like I bought the pants that way. After brainstorming for a day, I decided to make the insert a rectangle. After another day of trying to figure out how to turn a triangle widening into a rectangle and keep the right proportions, I came up with this. I hope that helps anyone who might also have this issue because I took shockingly few pictures of the process. Here is the side up close. The leg is still tight so the rectangle bows out a little. You can maybe see that the lace is sewn under the jean so that it will fray and I hand top-stiched the edges to make it stand out a little more. Full disclosure, my husband actually made these look 100x better. I actually sewed the lace into the pants so there wouldn’t be a frayed edge. He took one look at them and said, “I didn’t think they would look like that.” He then told me that frayed would make it blend better, and he was right. The left is the fixed side and the right was my first attempt. Since these jeans are holy anyway, the frayed made them look a lot more natural. What do you think? I’ve got some super cute kids clothes coming up SOON so stay tuned.